Philadelphia rapper PnB Rock was arrested at his suburban Bucks County town home on Sunday, 1/20, for numerous narcotics and firearms offenses. 27-year-old PnB Rock, aka Rakim Allen, was charged with Possession with Intent to Deliver, Possession of Narcotics, Receiving Stolen Property, Criminal Conspiracy and other related offenses. Bensalem Police Special Investigation Unit executed a search warrant at the residence on the 100 block of Konefal Street around 12:30 p.m. Police had received numerous complaints about loud parties and the constant smell of marijuana from neighbors in the Waterside development near the Delaware River. Investigators found probable cause that the resident was selling marijuana. During the search, authorities found four pounds of marijuana, scales, packaging material, over $33,000 in cash, and a stolen .40 caliber Glock handgun. 27-year-old Stephanie Sibounheuang was also in the house at the time. She was charged with Possession of Narcotics, Receiving Stolen Property, and Criminal Conspiracy. Bail was set at 10% of $500,000 for each and they were taken to Bucks County Correctional Facility. 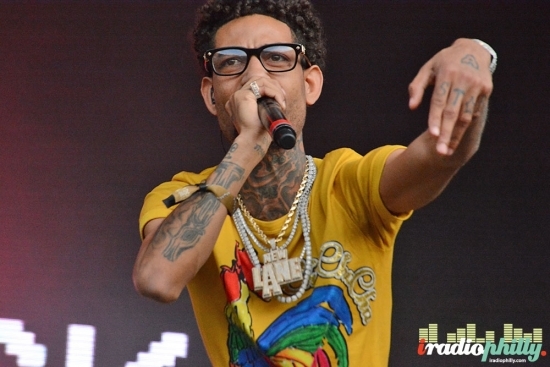 PnB Rock most recently headlined at The Met Philadelphia on December 28th, 2018. He also performed last June at Firefly Music Festival in Dover, DE. A Center City intersection has been closed until further notice after a large cave in. The Philadelphia Water Department has shut down the intersection of 20th and Chestnut because a hole has opened up in the middle of the street. Cars traveling northbound on 20th will be detoured at Sansom Street, and cars traveling eastbound on Chestnut cannot go beyond 21st Street. PWD will have crews out to the scene on Tuesday to access the problem and make any repairs, but they do not have a timeline for completion. Drivers should avoid the area if possible. A father and son are missing after an explosion and fire at a farmhouse in Lehigh Township, Northampton County. It happened around 12:45 a.m. on Monday 1/21 on the 1100 block of Blue Mountain Drive. Fire crews from all over the area responded. It was brought under control by 3:20 a.m. 36-year-old Bruce Miller Jr. and 10-year-old Bruce Allan Miller are unaccounted for. A body was found but it has not been identified. The cause of the explosion and fire is under investigation. The house is reportedly around 100 years old.